At Tree Service Ormond, land clearing is one of our expertise is. We have all of the heavy equipment and transport equipment to clear your lot. So if you have a lot it Is full of trees, underbrush, overgrowth, and more, we can come to your lot at your home or business and give you a free estimate as well as a schedule to complete all the work. There are many reasons for land clearing Ormond Beach, from wanting to develop land to getting rid of nuisance critters and animals. Whatever the reason we understand that most families in most businesses operate on a budget, so when we provide you with a free estimate this will be top of mine to make sure our pricing and scope of work is as competitive as possible. As part of our proposal, we will guarantee that when the job is done your land will be cleared completely, and We will not leave anything for you to clear on your own. Many tree service companies and demolition companies will commit to doing a job, and then leave you with a real mess to clean up and a job that is only 90% complete. This is not how we operate, and we understand that when the job is over the land needs to be clear and the piles need to be picked up. 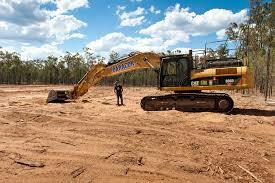 This is our commitment on all land clearing in Ormond Beach projects. So call Tree Service Ormond today at 386-267-8182 for a free estimate, and take the first step to beautiful and cleared land.